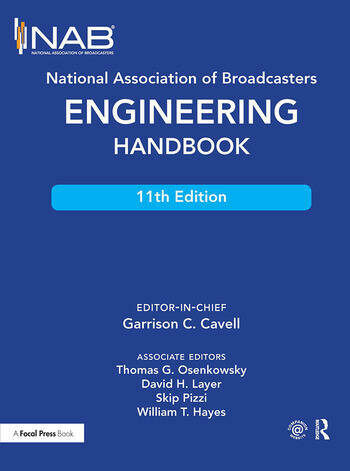 The NAB Engineering Handbook is the definitive resource for broadcast engineers. It provides in-depth information about each aspect of the broadcast chain from audio and video contribution through an entire broadcast facility all the way to the antenna. New topics include Ultra High Definition Television, Internet Radio Interfacing and Streaming, ATSC 3.0, Digital Audio Compression Techniques, Digital Television Audio Loudness Management, and Video Format and Standards Conversion. Important updates have been made to incumbent topics such as AM, Shortwave, FM and Television Transmitting Systems, Studio Lighting, Cameras, and Principles of Acoustics. 5.15 Weather Radar Systems- Baron Services, Inc.
Garrison C. Cavell has, over a 40-year career, been on the air, worked in radio and television station engineering management, was a radio station General Manager, a radio station owner, and a serial entrepreneur. His latest and most enduring venture was to found the firm that is now Cavell Mertz & Associates, Inc. where he remains a principal. He has a love for working with RF systems, and AM antenna arrays in particular. He has designed, built and certified countless station antenna systems over the years. Tom Osenkowsky began his career broadcasting as a news reporter while attending high school. He attended Central Connecticut State College and worked as a Final Quality Assurance Technician for Automation Industries in Danbury, CT. Tom is a Senior Member of the IEEE, iNARTE, and SBE. He holds Certified Professional Broadcast Engineer life certification from the SBE and a Master Engineer with RF Radiating Endorsement from iNARTE. Tom has held positions at various radio stations as announcer, Chief Engineer, Operations Manager and General Manager. He has served as an engineering consultant in the United States and Caribbean Islands, written engineering themed computer programs and made presentations at the IEEE Broadcast Technology Society (BTS) annual meeting, Broadcast Engineering Conference at the NAB Annual Convention and SBE Annual Convention. David Layer is senior director, advanced engineering in NAB's Technology department. David has been with NAB since 1995 and has been very active in the radio technology and standards setting area. He is the primary NAB staff person on NAB’s radio technology committee and the National Radio Systems Committee (NRSC). Outside of NAB, David is a senior member of the IEEE and is active in the IEEE Broadcast Technology Society (BTS), where he serves on the administrative committee, is a distinguished lecturer, and has been the chair or co-chair of numerous annual IEEE Broadcast Symposia (most recently in 2016). David is an associate member of the Association of Federal Communications Consulting Engineers (AFCCE). He was the recipient of Radio World’s 2015 Excellence in Engineering Award and was recognized by Radio Ink Magazine in November 2010 as among the top ten best engineers in radio. Skip Pizzi is Senior Director, New Media Technologies at the NAB. His career includes earlier work as an engineer and technical trainer at NPR, as an Editor at Broadcast Engineering magazine, and as an Audio Engineering Manager, Director of Media Standards, and Senior Technical Policy Analyst at Microsoft. He has been a regular columnist for several technical trade publications, and has authored or contributed to several books – the latest of which is A Broadcast Engineering Tutorial for Non-Engineers (4th edition), published by Focal Press, which Skip co-authored with Graham Jones. Skip currently serves as Vice-Chair of ATSC’s Technology Group 3 (TG3), which is developing standards for next-generation digital television. He is a graduate of Georgetown University, where he studied International Economics, Electrical Engineering and Fine Arts.